The real TTC ticket is 4B (lower left) in this assortment displayed June 11, 2008. The rest are fakes. Adult TTC tickets will no longer be sold after September if a new proposal intended to combat counterfeiting is approved by the transit commission next week. Under the proposal, announced early this evening, adult tickets would no longer be accepted as of September 28. 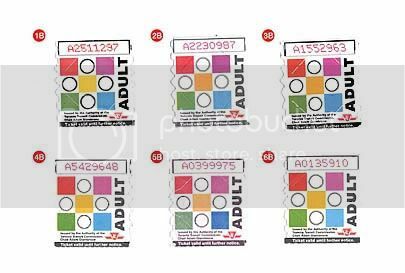 In mid-September, people who had already purchased adult tickets could exchange them for tokens at the Yonge-Bloor subway station or at TTC headquarters at Yonge and Davisville. Student and senior tickets would continue to be used, TTC spokesperson Brad Ross said, since most counterfeiting involves adult tickets. Since the introduction of new adult tickets in November 2007, Ross said, the TTC has noticed a dramatic increase in counterfeits. While the transit authority lost approximately 0.4 per cent of ticket revenue to fake tickets over the three years before the new ones came into use, that number has risen to about 1.5 per cent today - $300,000 to $400,000 per month. The counterfeits, Ross said, have become increasingly difficult for TTC employees to spot. In related news, ticket collector Nafisa Zahur, 31, was arrested last night and charged with several fraud and forgery offences. Nahur, a TTC employee for two years, allegedly sold counterfeit adult tickets from her booth at Wilson station. Police have conducted "several" investigations into the sale of counterfeit tickets in 2008, Ross said, but this was the first involving a TTC employee. What is the purpose of the tickets? Why not just use cash or passes? Good question RailBus 63 . TTC is stuck in the 70's. TTC is a mess cannot get there poop togather on anything, it really is sad. It is a totally demoralized system, and falling apart.